The Emtek Zeus is one of our modern handlesets that has a lot of personality. The long handle has a sloping curve on the inside that peaks in just the right spot to give your hand a nice grip. You have three finishes to choose from and there is a long list of interior knobs and levers that you can select to couple with the handleset. The Zeus comes with Emtek’s 5 year finish and mechanical warranty. 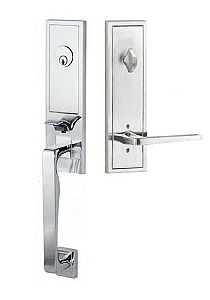 You will definitely be satisfied with this modern handleset sitting on your front door.